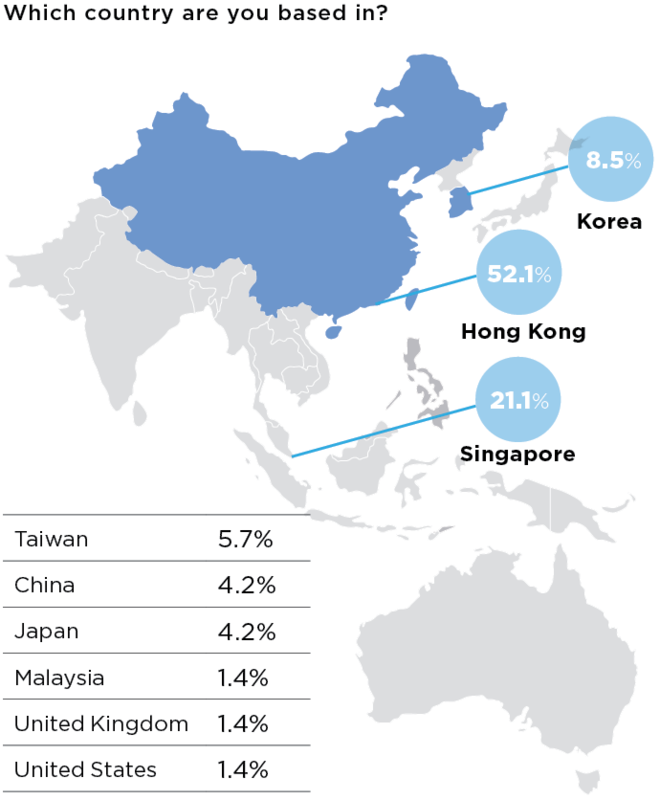 FinanceAsia and National Australia Bank’s latest poll of Asian bond investors shows strong demand to boost exposure to Australia — and a clear idea of which sectors will benefit. Australia’s domestic bond market stands out from its rivals in Asia Pacific, enjoying strong credit quality, stable rates and a plethora of structural innovations other markets can only dream about. This makes the Australian dollar market a natural place for Asian investors to look — and a recent poll conducted by FinanceAsia and National Australia Bank (NAB) shows they are doing just that. After a slight decrease in allocations to the market over the last 12 months, Asian investors are now eyeing a splurge. 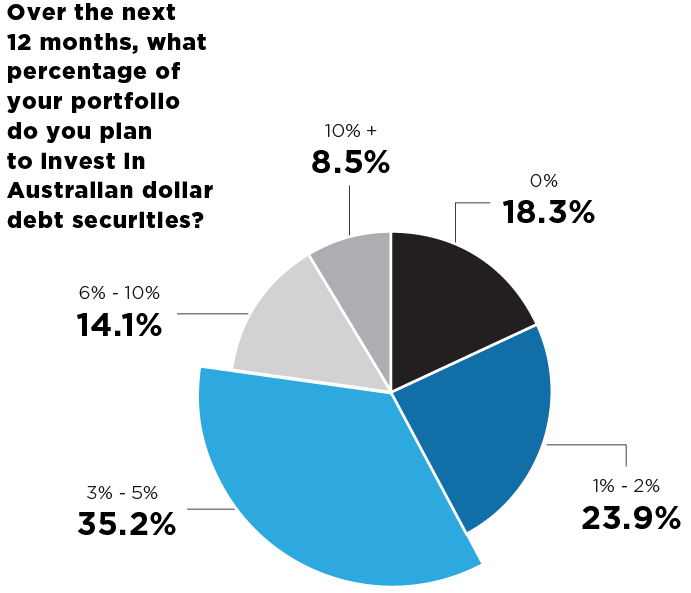 Out of the 71 investors who responded to the poll, around 81.7% plan to have exposure to the market over the next 12 months, compared to 54.9% that hold Australian dollar bonds now. Click the graphics below for a full view. It is hard to blame them. Australia’s economy may not offer the eye-popping growth rates of Asia Pacific’s emerging nations, but its maturity gives investors a lot of comfort, a lot of options — and a nice return. Many Asian investors are tempted by the yields on offer in Australia. 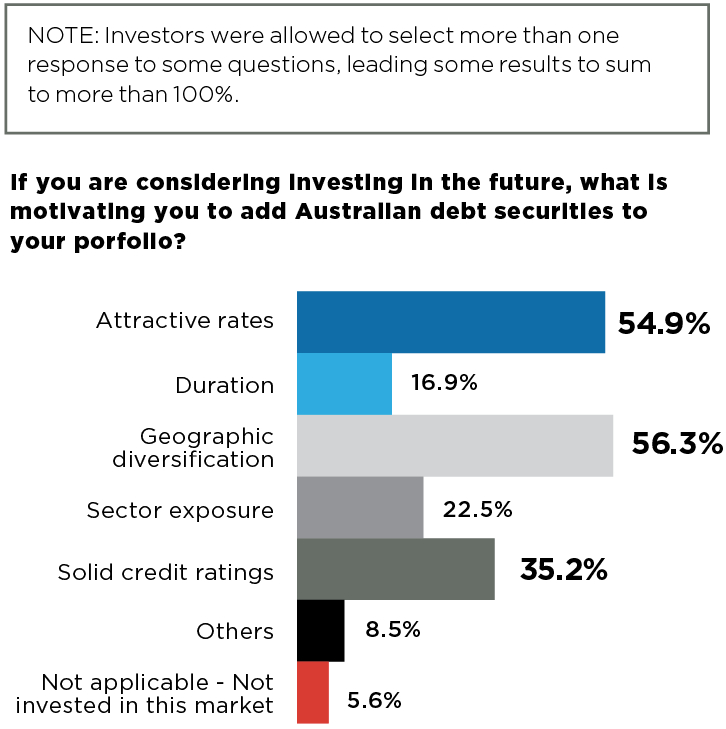 Some 54.9% of investors said attractive rates were a key motivator for them to add Australian debt securities to their portfolios, compared to 41.5% last year. Around a third of investors also pointed to solid credit ratings in the local market as a key driver of investment. But the biggest motivating factor was geographic diversification. That was a driver for 56.3% of respondents, compared to a paltry 23.1% in 2016. Australia may be a major part of Asia Pacific, but it also a country with a distinct identity, economy and financial market. Investors want it to stay that way. 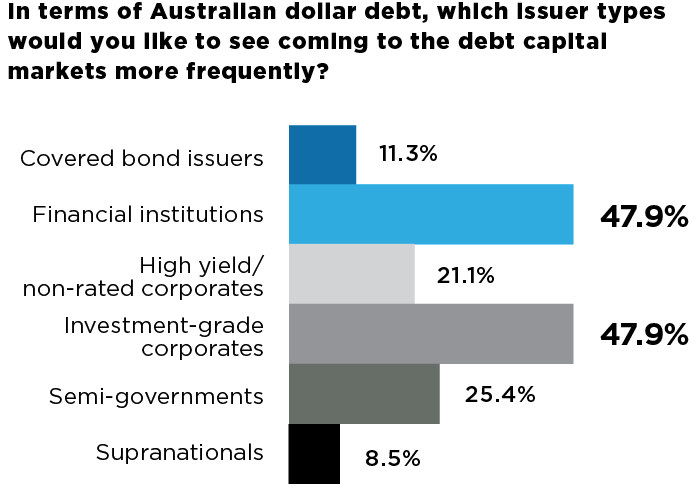 Most Australian issuers will be able to find good news in the poll. But although Asian investors appear keen to add more Australian credits to their portfolios, they are becoming increasingly discerning. 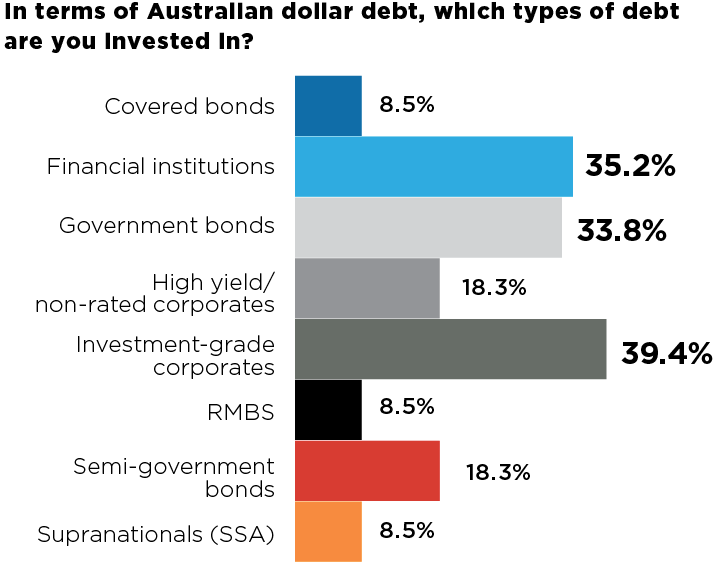 What do Asian investors look for when buying Australian dollar bonds? A strong banking sector makes investing in bonds from financial institutions an easy option. The stellar ratings enjoyed by many corporations in the country means credit work is kept to a minimum. But although supply from banks and investment-grade corporations was highly-anticipated by investors, the most eye-catching result was the emphasis Asian investors put on certain sectors. Since 2014, FinanceAsia has asked Asian investors which sectors they wanted to see more issuance from in the Australian dollar market. The results are usually fairly evenly spread. No one sector has previously been favoured by more than 40% of respondents — and last year, no sector got more than 25%. That changed dramatically in 2017. The biggest draw for Asian investors eyeing Australia’s debt market is the infrastructure bond market. 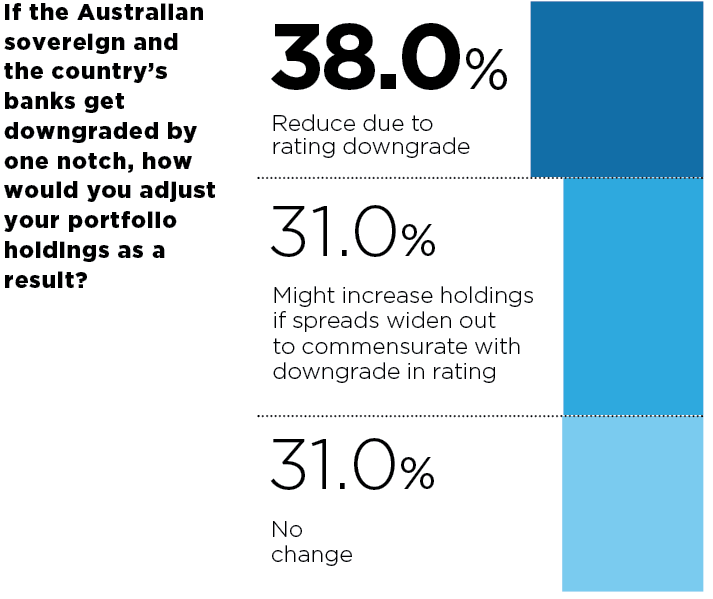 Some 54.9% of Asian investors polled said they wanted to see more infrastructure issuance in the Australian dollar market — compared to just 23.1% in 2016. This reflects an unstoppable movement towards more infrastructure funding across Asia Pacific. The Asian Development Bank thinks around $26 trillion is needed to get infrastructure in the region up to speed. But it is going to be a long time before the bond markets play a major role in funding infrastructure for much of the region. Australia is an exception. When WSO Finance, operator of the Westlink M7 motorway, turned to investors in March with a A$535 million 10- and 10.5-year bond, Asian investors snapped up around 12% of the deal. Ausnet Services, an energy company, managed to sell around 40% of a recent deal to investors in Asia and Japan. Australia’s infrastructure bond market fits perfectly into the portfolios of long-term investors such as pension and insurance funds, offering them an alluring combination of long tenors and strong credits. On average, NAB allocates around 15-20% of the Australian infrastructure bonds it manages to Asian investors, Tilton said. These investors are going to become increasingly important in the coming years. China’s Belt and Road Initiative has raised awareness of infrastructure bonds among Asian investors, but for now, supply is still limited. Australia is an exception. But although infrastructure undoubtedly grabbed the attention, there were other bright spots in the market. Australia’s biggest utility companies have long been viewed by foreign investors as safe-havens. They boast at least some government support, have easy access to financing options, and tend to have stable, reliable revenue streams. But their bond supply is not enough to satiate investors. These issuers get 65% of their funding from capital markets, Fox said. But they do not simply rely on the domestic market. Last year, Australian utilities raised around $2.39 billion in the US dollar market, almost four times they amount they raised at home, according to Dealogic. They issued another $267 million in Hong Kong dollars, and $142 million in Singapore dollars. These alternative sources of funding limit supply from Australian utilities in their domestic market — ensuring strong demand for the deals that do come. But even those Asian investors who can get exposure to Australian utilities offshore appear just as hungry to buy domestic deals. When Ausnet raised A$425 million from a 10.5-year deal in February, investors in Asia were a major factor in driving the order book to two times covered. It is clear investors are becoming more discerning in their choice of sectors. But one source of funding offers huge potential to issuers hoping to diversify their investor bases. There is only one caveat: they have to go green. Australian issuers have made clear progress in the issuance of green bonds. Flexigroup won a FinanceAsia award last year, after selling an ABS deal that included a green bond tranche. The Hallett Hill windfarm created an opening in the US private placement market. Queensland and Victoria have added local government issuance to the fray. The green bond market looks likely to become an even more important source of funding for issuers across the region, but especially in Australia. The maturity of the local investor base means green credentials will increasingly be stressed. The growing familiarity of Asian investors in the format — helped by a strong of dollar deals from Asian corporates — will ensure the offshore bid stays strong. But Australia is making bigger strides than just growing green bond issuance. The broader focus for bankers and issuers is seeking out investors with an environment, social and governance (ESG) focus, helping them bring attention to a range of causes. NAB was behind one prominent recent example — a A$500 million gender equality bond. The proceeds will go to fund loans only to those companies that have been given top markets for gender equality by the Australian government. The market for ESG bonds is only going to grow from here, bankers say. Green bonds will take the lead, but other structures will follow. And although there is little evidence of a pricing advantage at this point, there are already two clear plus-points to selling a bond that combines a clear conscience with economic sense. From green bonds to infrastructure, from corporate deals to bank covered bonds, it is clear Asian investors are planning to return to Australia’s capital markets in force. This is making it easier for Australian issuers to move out along the curve. Foreign investors in Australia’s bond market have spent the better part of the last decade sticking to five- or, at best, seven-year deals. But that is starting to change. Last year, some 54.5% of Asian investors said finding the right tenor was an essential driver for their investment decision-making. In the latest poll, that had fallen to 29.2%. “Investors feel comfortable now,” said Tilton. The comfort of Asian investors in the market will be a boon for local issuers. 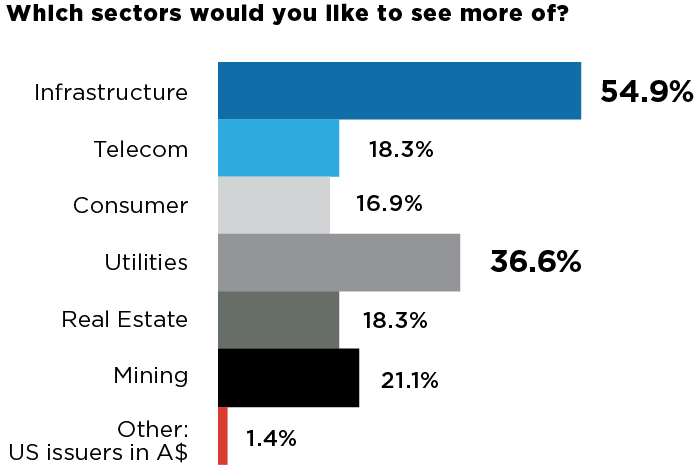 Infrastructure companies, financial institutions and utilities look set to get the bulk of that demand. But a rising tide lifts all boats. For Australia’s debt issuers, there could be few better times to set sail. There are few things worse for a debt market than a limited investor base. Those markets that rely too much on one class of investors are at the mercy of a herd of investors who buy and sell practically in unison, each driven by the same fundamentals and the same fears. This is not the case in Australia. The investors polled by FinanceAsia included a broad range of funds and banks (see table). Among the 71 that responded, there was wide diversity, with Hong Kong investors making up around 52.1% and those in Singapore representing 21.1% of those polled. There was a shift away from Malaysia and Philippines investors in the latest poll. The diversity of investors can help ease the pain when one group exits the market. 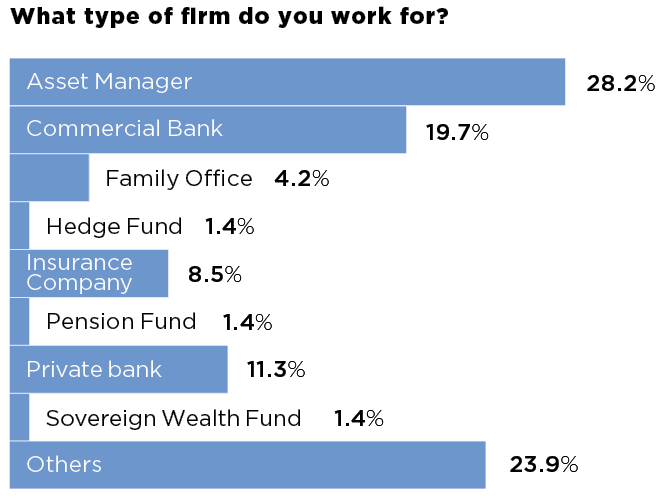 A case in point is the demand from hedge funds, which has declined sharply in recent years amid worries about secondary bond liquidity and complaints about the cost of funds, according to Tilton. No issuer wants to see investors exit a market, but consistent demand from foreign banks, real money accounts and high-net-worth investors has certainly softened the blow. This is not true for all investors, of course. Plenty of fund managers only plough into the Australian dollar market when they see a relative value opportunity. But the diversity of the investor base adds a crucial source of flexibility to issuers. It also added a diverse range of opinions to our latest poll.